1 boneless top round roast, approximately 4 to 5 lbs. Roughly chop carrots, celery, and onions and set aside together. Mince garlic and set aside with the other vegetables. Tie beef with butcher’s twine. Place 1/2 cup of flour in a shallow bowl. Coat beef in flour. Heat vegetable oil in a large Dutch oven over medium heat. Add beef and brown on all sides, approximately 2 to 3 minutes per side. Remove beef from Dutch oven to a plate. Heat 1-1/2 qts. stock in a separate medium pot until simmering. Combine crushed tomatoes, vinegar, and chili powder in a small mixing bowl. Add tomato sauce to stock and stir to combine. Add carrots, celery, onions, and garlic to the Dutch oven and saute over medium heat until tender, approximately 6 to 8 minutes. Add remaining 6 Tbsp. of flour and stir with a whisk to create a roux. Allow the roux to cook over low heat for approximately 4 minutes, stirring frequently. Pour stock and tomato sauce mixture into the Dutch oven and stir, cooking over medium heat for approximately 5 minutes or until sauce is thickened. Return beef to the Dutch oven and submerge in sauce. Add additional stock as needed to submerge beef. Cover Dutch oven with a crack to allow steam to escape. Cook over medium-low heat for 2-1/2 to 3 hours. Skim fat off surface of the cooking liquid and discard every 15 to 20 minutes. Transfer cooked pot roast to a plate and cover with foil to rest. Pour cooking liquid through a strainer to yield gravy, discard solids and vegetables. 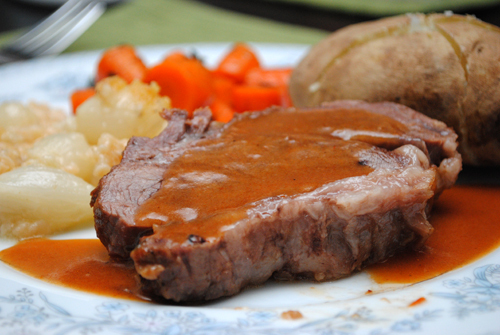 Slice pot roast and serve with gravy.